Playground equipment for children, public furniture, art objects, meditation rooms, arbors, small rest spaces, waiting rooms, chairs with roofs. Three cubes are the micro-architectures with the various characteristics and functions. Three cubes can be easily transported by a truck and can be installed, because of the size and the shape. Three cubes with the rich spatial implication can give the new public extensity to each place and can activate urban spaces. In terms of the size, the installation (the inclination), seat surfaces, windows etc., each cube is designed characteristically. Three cubes are referenced to Japanese traditional spaces like tea ceremony rooms. 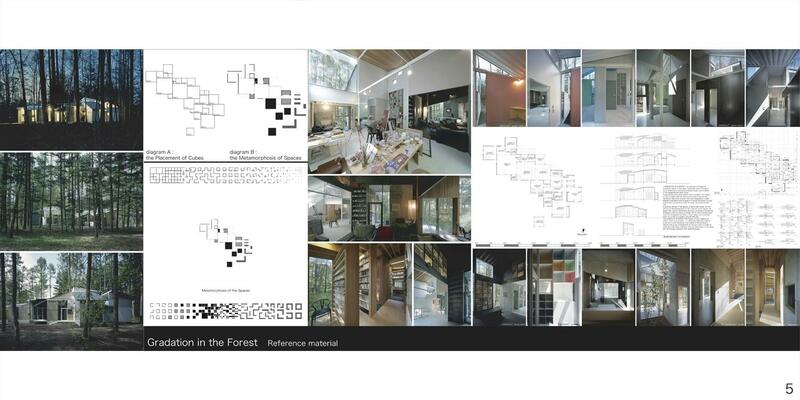 Its characteristics can be explained from the viewpoint of richness, variability, mobility of minimum spaces. 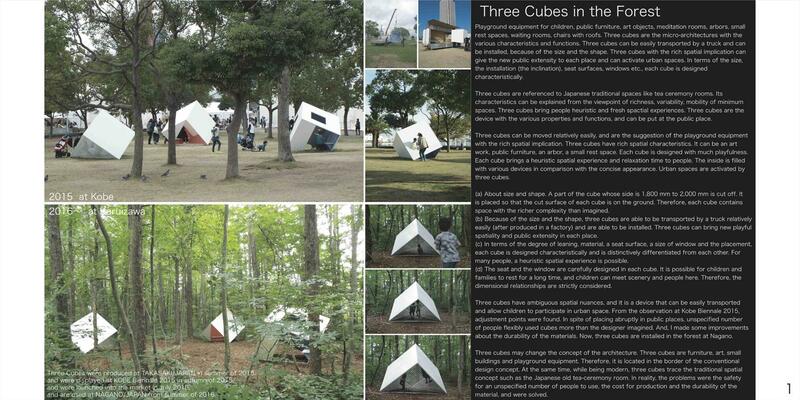 Three cubes bring people heuristic and fresh spactial experiences. Three cubes are the device with the various properties and functions, and can be put at the public place. Three cubes can be moved relatively easily, and are the suggestion of the playground equipment with the rich spatial implication. Three cubes have rich spatial characteristics. It can be an art work, public furniture, an arbor, a small rest space. Each cube is designed with much playfulness. 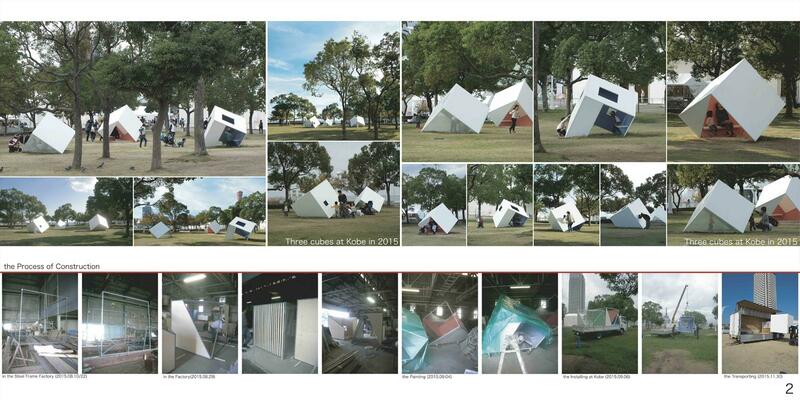 Each cube brings a heuristic spatial experience and relaxation time to people. The inside is filled with various devices in comparison with the concise appearance. Urban spaces are activated by three cubes. (a) About size and shape. A part of the cube whose side is 1,800 mm to 2,000 mm is cut off. It is placed so that the cut surface of each cube is on the ground. Therefore, each cube contains space with the richer complexity than imagined. (b) Because of the size and the shape, three cubes are able to be transported by a truck relatively easily (after produced in a factory) and are able to be installed. 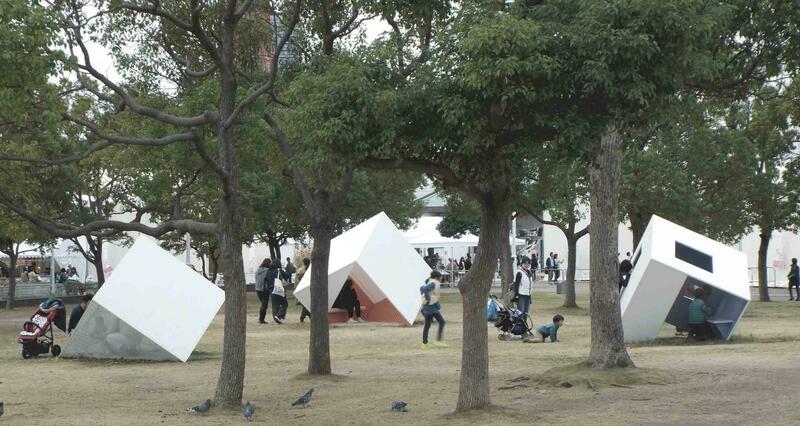 Three cubes can bring new playful spatiality and public extensity in each place. (c) In terms of the degree of leaning, material, a seat surface, a size of window and the placement, each cube is designed characteristically and is distinctively differentiated from each other. For many people, a heuristic spatial experience is possible. (d) The seat and the window are carefully designed in each cube. It is possible for children and families to rest for a long time, and children can meet scenery and people here. Therefore, the dimensional relationships are strictly considered. Three cubes have ambiguous spatial nuances, and it is a device that can be easily transported and allow children to participate in urban space. 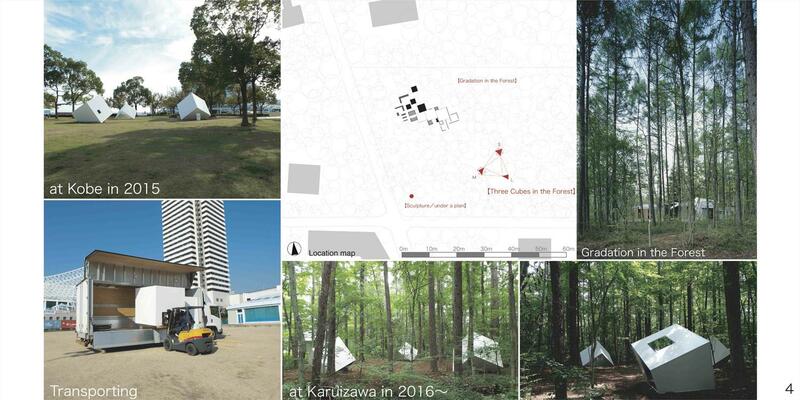 From the observation at Kobe Biennale 2015, adjustment points were found. In spite of placing abruptly in public places, unspecified number of people flexibly used cubes more than the designer imagined. And, I made some improvements about the durability of the materials. 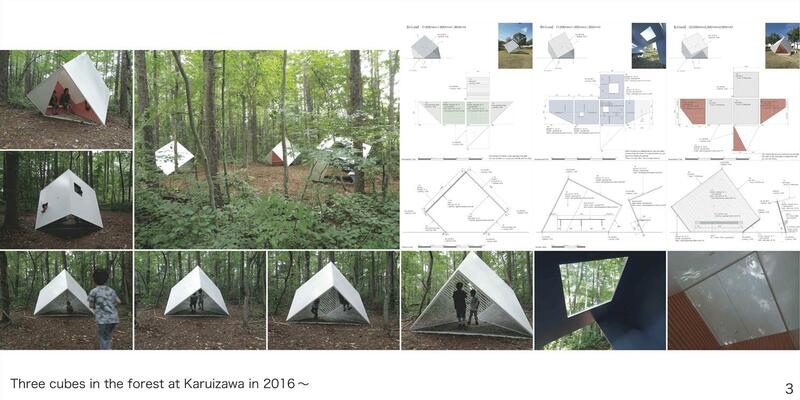 Now, three cubes are installed in the forest at Nagano. Three cubes may change the concept of the architecture, and are furniture, art, small buildings and playground equipment. Therefore, it is located in the border of the conventional design concept.